This is a quite detailed guide about trophy pushing in Clash of Clans, which is inspired by ClashLegend02. This guide contains all important experiences, tips and notices for you on the road to be a Champion. So what is trophy pushing in Clash of Clans? Trophy pushing or trophy hunting is one of the common activities in Clash of Clans which just focuses on collecting as much as trophies as possible and really doesn’t care about loot. Why should I do trophy pushing? I am sure that there are a lot of players who still doesn’t know about the profit of trophy pushing. Improve your skills on new Clash of Clans strategies. To find a best place for farming. To earn rewards for won matches at top high leagues. (Up to 360k loot and 1200 Dark Elixir for every won match in Champion League). I strongly recommend that you should go to higher leagues If you are at mid or later Town Hall 10. Because at there, you can train a lot of new strategies with another strong villages. You need a good trophy base with maximum protection. Sometimes, other players visit your base and lose the battles, you can get a lot of trophies without attacking other villages. 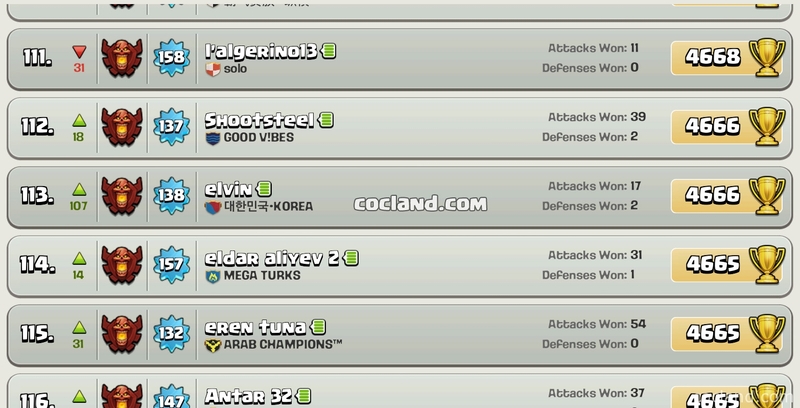 A good defensive base can also help you minimize lost trophies after being attacked. There are a lot of good layouts at the Base Designs section. Here are some most popular and effective strategies for pushing trophies in Clash of Clans. Barch: Barch = Barbarians + Archers. This is one of the cheapest strategies and requires a small time for training troops. With this strategies, normally you can get 1 star by dragging. Normally, Barch works most effective from Bronze to Crystal III. At higher leagues, there are plenty of hard bases that you hardly can get 1 star by using this strategies. I always use 40% Barbarians, 45% Archers and the rest is Wall Breakers. You can change it to the best composition for you. For more details about this one, you can read at Barch Strategy. Balloonion: This is another quite popular farming strategy in Clash of Clans. With 30 Balloons and the rest is Minions, you can easily get 1-2 stars. For using Balloonion, just deploy your Balloons in a line on one side of the base you want to attack then deploy your Minions right after them. With Rage Spells, your Balloons can go into the core easily. Your Minions will stay outside to remove all other buildings. GoWiPe: This is quite expensive strategy but it is one of the most powerful strategies too. I usually use it for Clan War, but before being an elite GoWiPe users, I used it a lot while farming in Champion League. You can see much more other powerful strategies at: Clash of Clans Strategies. Normally, with just Barch and Balloonion, you can go to at least Master Leagure easily. All you need is having time for playing. Trophy pushing requires a lot of time. If you are lucky, you will face a lot of farming bases which have the Town Halls outside, all you need to do is just placing your Heroes so they can hit the Town Hall. Sometimes you will face trap bases. They are look like a farming bases but there are a lot of traps and Hidden Teslas next to the Town Hall. Always drop 1-2 small troops for testing first before attacking it with your Heroes.